Ever heard of the really small island in the middle of the Mediterranean called Malta? Well if not, you sure are missing something. The Maltese Islands with its rocky shores is an ideal place for diving. The little island group in the Mediterranean has a world renowned reputation for clear waters, excellent wreck diving, colorful cave systems and an over all presence of local sea life. Malta has alot more to offer, wherever you go, Malta´s old and impressive history will always be around you. Temples dating more than 8000 years, medieval and WW2 fortifications. 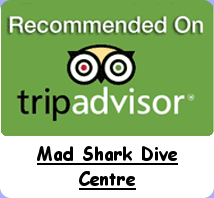 At Mad Shark we are a fully qualified PADI, BSAC and CMAS training facility, we can offer a huge variety of dives around the islands to suit everyone from absolute beginners to the most experienced Tec divers.